We all love viewing videos and images with the best possible quality and viewing experience that is available. And as of now, the most satisfying such experiences can be delivered by the 3D video players. Be it watching animation movies or power packed action films, 3D viewing can make you feel as if everything on screen is happening around you. And the icing on the cake is the high-performance sound functionalities that these 3D video players provide. Although most of them offer a free trial for a few days, to get the most of out these players, it is better to upgrade to the premium versions. 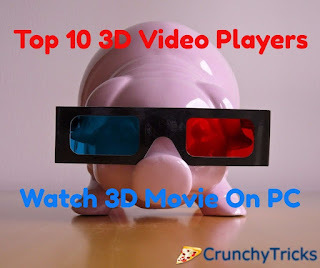 Here are 10 3D Video Players that will redefine your notion of a perfect viewing experience. Corel WinDVD Pro 11 is the latest version of the video player software. It can play Blu-ray 3D videos to give the user a perfect 3D exposure. Also, AVCHD, DVD, and other standard video formats are also supported by this player. You can even play regular DVD videos, and the video will be played with Blu-Ray quality. Compared to the 2010 version, the new version has 2D to 3D conversion. With this, it is possible to make even the obsolete 2D videos in your device exciting to watch. It is better to play Blu-Ray discs on a desktop PC as the integrated video card in modest laptops are not capable enough to play them. It also has some video enhancement tools such as noise reduction, color correction and lighting tools to brighten up your video. Motion streamliner and anti-shake capabilities are just some other functionalities of Corel WinDVD Pro 11. The trial version is free. Give it a try and buy the full version if you are happy with it. One of the best features of PowerDVD 16 Ultra is the TV Mode that it offers. With this, you can get the 3D experience on your TV screen by connecting PowerDVD and your mobile phone acting as the remote. The videos can be viewed with the quality better than the original video clip. You can even download 2D YouTube videos and watch them offline with the Online Video Downloader feature. It supports almost all the common video, audio, and image formats. PowerDVD adjusts according to your device’s playback specifications so that you can enjoy slow motion videos without making any settings changes or having extra plugins. You can even get the PowerDVDLive, Pro or Standards versions. The TV mode, however, is available in Live and Ultra versions. VLC Media Player is perhaps the most popular and praised Media Player because of its free-to-use feature. We have all been using VLC Media Player for a long time to view 2D videos. But it can play even 3D videos which are going to make you love this particular tool even more! VLC Media Player is also available on Mac and Linux platforms. Open the video in VLC Media Player. On the top left corner of the window, click on Tools. Further, click on Effects and Filters. Mark a tick against the Wall option. Set rows as 3 and column as 2. You can now see multiple windows appearing on the screen. Enlarge, one of those, to see the 3D video. 3D Media Player plays 3D and 2D videos. It also converts videos to 3D playback. To get the conversion feature and to get rid of the watermark, you will have to upgrade from the trial version. 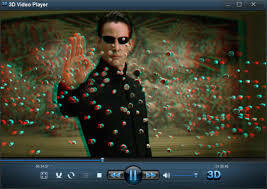 A tempting feature of 3D Video Player is the easy-to-use interface that it has. It has the basic Play, Mute and Volume control buttons. You can activate the 3D mode by a simple click on the 3D button. 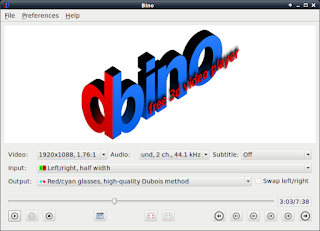 Bino is a 3D video player and is useful due to its support for multi-display video that can be used in Virtual Reality installations and multi-projector adjustments. It works on Linux, Mac OS, and Windows platforms. It is an open source player which makes it free to use. TotalMedia Theatre 6 is well suited for Blu-ray, 3D, HD, DVD, and most other standard videos. You can upgrade SD videos into HD and get 3D video experience from 2D videos. Using your smartphone as the remote, you can play HD and Blu-ray videos on your PC to TV, or projector. TotalMedia Theatre 6 works on Windows 8 platform. Although a little expensive, with an easy to use interface that it has, the video experience it brings forward is truly alluring! You can customize the viewing by setting left/right, top/bottom, and anaglyph 3D modes manually. Even low-resolution videos and DVDs are transformed into better quality videos using ArcSoft SimHD. And you can make dynamic lighting, noise removal, anti-shake and smoothness enhancements. High definition videos of MKV, AVCHD, MPEG-4, MOV, MP4, AVI are also supported. The sound quality is also pretty impressive. You also have options to play YouTube videos. KMPlayer supports most video formats such as AVI, ASF, WMV, AVS, FLV, MKV, etc. You can customize the visualizations, plug-ins, and playback options. 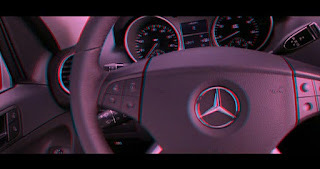 3D formats are well supported by KMPlayer. Video or audio files can be handled by KMPlayer. It is a lightweight application and where can play 2D videos too! 5KPlayer supports MP4, MOV, M4V, MP3, and AAC. You have the option of running it on Windows and Mac platforms. All you need is a pair of 3D Anaglyph glasses; 5KPlayer brings you a smooth 3D viewing experience. You can also download and watch Netflix 3D movies in MKV, MP4 formats. Just drag and drop the video onto the 5KPlayer UI and you are ready to go! NVIDIA brings to you 3D viewing experience using NVIDIA 3D Vision Video Player. You can also video images of various formats. And there are cropping and zooming functionalities available too. And you have options to view 3D in side by side and anaglyph. The Playback options are easy to understand with the comprehensive UI that you will find on this player. Available in three configurations, can be used to view videos that are on your device or even to display streamed videos. LITE is a free demonstration version with a watermark. STANDARD is the commercial version with specifications as 1920×1080 60P* per eye. PRO version gives the best experience with enhanced features functionality. Using the various playback options, you can view 3D videos with 3D glasses, projectors, and PlasmaTV. Give a trial run and grab the ones you like to get the best features possible. Just delve into the 3D world and give yourself a feast to the eyes!